I think this photo unequivocally sums up the whole wedding of Erika & Mark. The whole day was filled with nothing but laughters. When I went to the bride's hotel suite at Olive 8 for getting ready coverage. Erika told me right off the bat that Mark warned her he would not marry her if she ends up late to the ceremony. Having had heard that, I made that my top mission not to screw up on. As I tell every single one of my client- you never know what's going to happen on your wedding day, don't be surprised if things go behind the schedule. And of course that's exactly what happened to Erika and Mark's wedding as well. When we were at the hotel, Erika's sister does not fit into her dress anymore. We had 3 bridesmaids in the corner of the room trying to squeeze her into the dress. The bride Erika herself also happened to have the same problem. The girls ended up getting to the ceremony an hour late. It was a relief to see that the groom was still there patiently waiting for Erika to walk down the aisle with a smiley face. 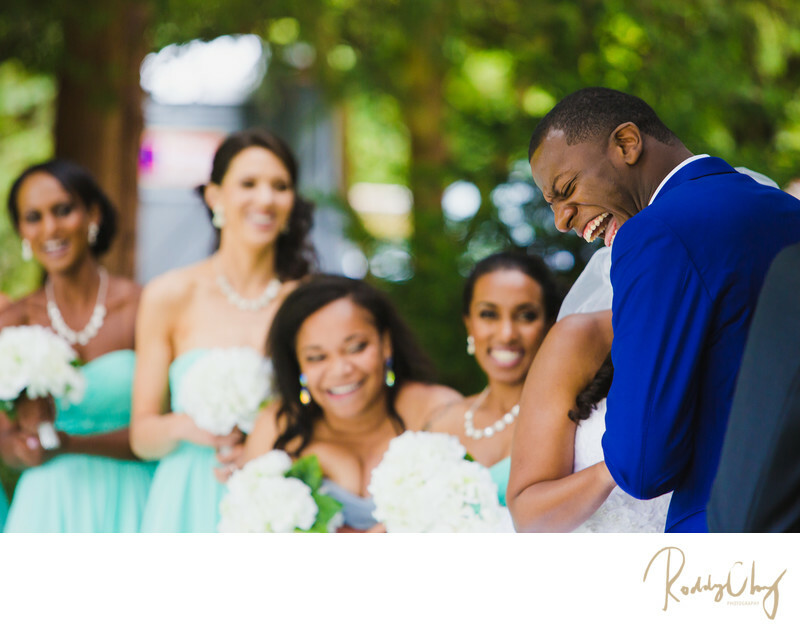 But once the ceremony started as they were all trying to calm down from all the chaos, they just could not hold back the laughters with all that have happened to them. This was a perfectly candid moment that really speaks to the both of them. Location: 650 W Highland Dr, Seattle, WA 98119.